I’ve had an Arduino-based weather station since June 2009, but one problem with it has been that there hasn’t been any easy way to display the data in real time without going to the database (or the raw import files) to see what the latest observations were. I wrote a quick web page for this (home display), and this is convenient if I want to see what the temperatures are around the house when I’m not at home. But sitting in the living room, it’d be nice to know what the temperatures are just by looking. The choices for displays aren’t all that great. Arduino can drive the classic seven segment LED displays (like old calculators, for those who remember what a calculator is), which are big and bright, but it requires a lot of pins, and even more power to light enough of them to display the amount of data I need (at least four temperatures, and possibly other sensor values like pressure or light). There are graphical LCD panels, which you control pixel by pixel but are expensive and aren’t all that large. And then there are text LCD displays that use the Hitachi HD44780 controller (or one based on it). These are more like old terminal screens where you can write to each character position on the screen. Common sizes are 16 characters across x 2 rows and 20 x 4 displays. I chose a white on black, 16 x 2 display (SparkFun LCD-00709). 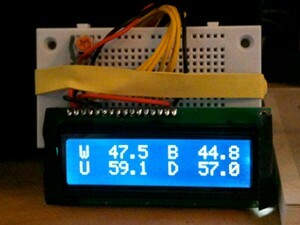 It requires 5 volts to power the display and the LED backlight, and uses six of the digital pins on the Arduino board. 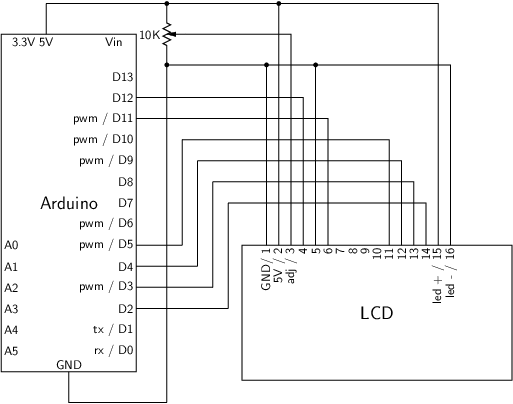 The Arduino Uno (and earlier Duemilanove) have fourteen digital pins (two of which are the serial TX/RX pins), so one could hook up two of these displays to a single Arduino. The hookup for a single display, and the code I’m using follows. The Arduino Cookbook was invaluable for getting the everything working. 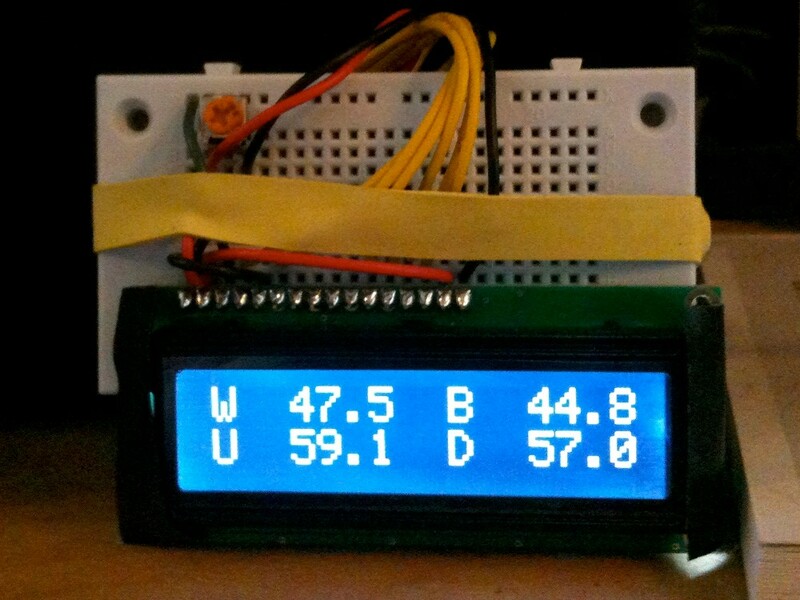 query = "SELECT west, back, down, up FROM arduino_view;"
Each minute, it reads the temperatures from a database view that consolidates the latest readings from the weather sensors (arduino_view), formats them in the manner the Arduino display code expects, and sends them to the serial port for display. It works really well, and looks good. I wish the display itself were larger, however. I’ll probably get a second LCD panel so I can display more data, but if someone would make a 20 x 4 display that was twice as large as the one I’ve got now, I’d buy it. The 16 x 2 is easy to read from the couch (five feet away), but isn’t readable from the kitchen.